Hope you get an unbalanced wheel and be prepared to exploit this handy fact. Base your strategy off of the deterministic nature of the spin of the ball and the wheel. Casinos will do their best to prevent (1) from happening, but they can’t do anything about (2). The reason why they can’t prevent (2) from happening is because bets are allowed to be placed after the wheel has started spinning. This means you can observe the motion of the ball and the wheel before placing a wager. History is littered with people trying to squeeze money out of casinos. Here is a brief overview of a few that stand out. In 1873, an English mechanic and amateur mathematician who went by the name of Jagger carefully observed six roulette wheels at the Monte Carlo casino. He and his assistants logged the outcome of the each spin of the wheel for five weeks. Analysis of their data showed that each wheel had a unique bias due to factory imperfections which Jagger was quick to exploit. According to some sources, Jagger walked away with £65,000. In his daydreams about the nature of chance, Henri Poincaré used a slightly different version of a roulette wheel to show how sensitivity to initial conditions can be used to figure out the ultimate resting state of the wheel. Aside: sensitivity to initial conditions forms a cornerstone of modern chaos theory. Three gamblers who were arrested for hiding a laser scanner in their smartphones to predict where the roulette ball would most likely stop (based on the laser’s estimation of the ball’s velocity and position). Luckily for the gamblers (and not for the casino), they were released without any charges and were allowed to keep their £1.3 million winnings. The laser from the smart phone was linked to a computer that was able to make calculations fast enough for the three to make their bets before the dealer said, “No more bets.” The work of Small and Tse are extremely similar to this case. If you want to beat the house at roulette, it helps to think like a physicist. A simple model of the motion of a roulette wheel and ball, based on physics principles and confirmed by experiments on an actual wheel, has revealed two ways of overcoming the usual odds against roulette players. The key, the modelers found, is knowing the precise location of the ball and the relative speeds of the ball and wheel when the croupier — the casino worker in charge of the game — sets the wheel in motion and releases the ball. Before going further it is good to have a basic understanding of the game. In this horizontal view you can see and understand the complex nature of the roulette track and wheel. “Knowing the initial conditions allows you to beat the odds,” said Michael Small, a statistician at the University of Western Australia in Perth, who carried out the study with Chi Kong Tse of Hong Kong Polytechnic University. “In some cases you can beat them quite significantly” according to their paper posted in the journal of chaos. The simpler method the pair tested involves careful observation and recording of the initial conditions by an individual or team of players. In experiments on a roulette wheel in a laboratory, the method produced predicted earnings of almost 20 percent instead of the expected loss of about 2.7 percent for a European-style wheel. In U.S. casinos, the odds tilt further in the house’s favor because the wheel contains one extra space. The other approach, using a digital camera mounted above the wheel to obtain the same data, provided better predictions. But for gamblers it presents the obvious problem of how to conceal the equipment in a security-conscious casino. Small and Tse used high-school calculus and physics — specifically, the branch known as classical mechanics — to develop their model. They wrote down equations to predict the path the ball would take once the croupier releases it. The pair tested their model on a standard casino roulette wheel installed in Tse’s laboratory. Small recorded on a computer the times at which the ball and a specific part of the roulette wheel passed a fixed point on the frame supporting the wheel. “You basically press a button when the ball passes a certain point and then use that timing to make a prediction,” Small said. Predicting the half of the wheel in which the ball would settle would allow a gambler to bet on a combination of numbers with some confidence. The concept of using scientific understanding to beat the house isn’t new. 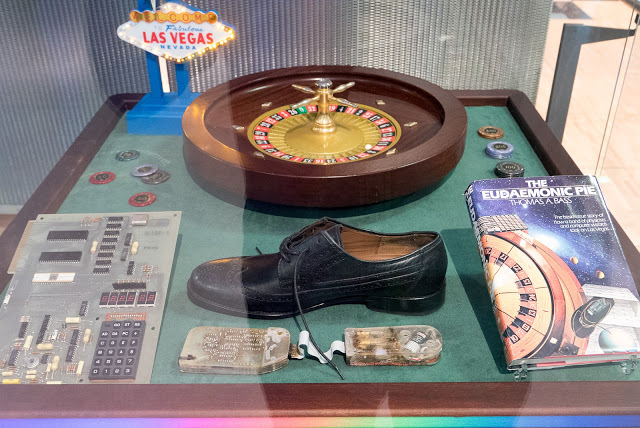 In the late 1970s the “Eudaemons” a group of physics postgraduates, used theoretical insights and a rudimentary computer concealed in a shoe to win at roulette in Nevada in the 1970s. But since they didn’t publish their research, nobody outside their team knows the details of how they did it. On the heels of this new research, however, J. Doyne Farmer, a group member who is now a professor of mathematics at Oxford, has written a report on the exploit that he plans to submit for publication. Small and Tse extended their research by taking advantage of modern technology. They mounted a digital camera directly above their roulette wheel to obtain better measurements of the physical parameters. In 700 trials, they confirmed the validity of their model and identified certain numbers on the wheel in which the ball settled preferentially. The study suggests strategies for both sides of the roulette wheel. Let’s use polar coordinates to describe the position of the ball, since we are on a wheel. We normally use Cartesian coordinates – the x-y plane – but due to the symmetry and naturally circular state of our system, polar coordinates are more intuitive. Polar coordinates describe location in space in terms of the distance from the origin and angle measurement . The picture below describes the transformation from Cartesian to polar coordinates. The authors model the ball as a single point, so its position in can vary between , where represents the farthest point from the middle of the wheel that the ball can be – the very edge of the wheel. Similarly, is the radial distance to the location of the metal deflectors on the fixed part of the wheel (stator). is the angle of rotation of the inner wheel. The physics diagram above also shows a free-body diagram of the forces acting on the ball as it travels on the roulette wheel. is the mass of the ball. The angle is the angle of incline of the stator, and is the radial acceleration of the ball. Obviously, is gravity. The authors assume that the deflectors are evenly distributed around the stator at constant radius . In terms of a derivative, this means . There are going to be two models here: one model with a completely horizontal table and one model with a tilted surface. Comparing the two results shows how critical it is for the roulette wheel to be on a totally flat surface. While on the rim, is constant, and the ball has a varying angular velocity . decays only due to a constant rolling friction. The ball leaves the rim at the point where its velocity squared is: . 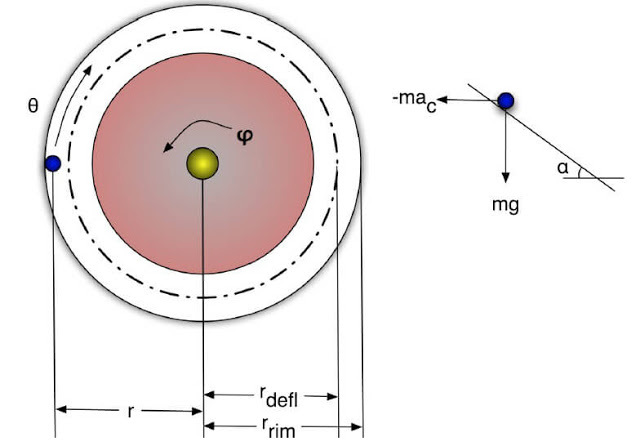 As it turns out, for a level table, the time spent from leaving the rim of the wheel (1) until the ball is about to hit the deflectors (4) is fairly consistent because the ball leaves the stator with exactly the same velocity each time. Thus, it is possible to estimate the position of the ball without having to integrate the equation above by using tabulated numbers. For a tilted roulette wheel, the ball will favor one half of a wheel more than the other. A tilt of about 0.2 degrees is more than sufficient to bias the wheel. After presenting these mathematical models for the motion of the wheel and the ball, the authors delve into some pretty lengthy and intense numerical simulations that support their model. They examine the sensitivity of their model to parameter uncertainty to see what sort of changes casinos may have to make to their roulette tables in order for the house to have a natural advantage (good news for the casinos; it’s only minor adjustments). The authors also realize that the game is truly predictable with some degree of certainty (good news for gamblers; this is a relatively honest game). Dealer’s signature. Can dealers shoot a wheel sector? Delayed Parachute strategy: Huge wins! Becoming a professional roulette player. Can you trust online roulette?